Torrential rain and flying boulders of the size of excavators in Likhubhir interrupted traffic moving to and from Kalimpong and the state of Sikkim for around 4 hours last night. The landslide occurred at 7:45 pm and the traffic was restored around 10:50 pm last night. The gigantic size of the boulders and debris caused trouble for the authorities as they had to engage rock breakers to clear the route. However, no casualties have been recorded. Notably, nine landslideprone spots have been identified in the 0-9 km stretch of NH 10.The stretch starts from Coronation Bridge at Sevoke ,Bhasua till Hanuman Mandir. Swethijhora,which prone to slides, is a major danger zone for daily commuters due to stones tumbling down at regular intervals, thus hindering the traffic movement along the road. 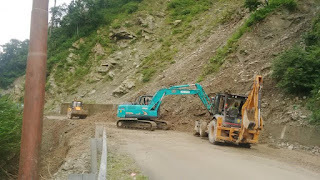 Two fresh landslide points have also been identified, believed to the result of the construction of a new kutcha road next to the NH10. Landslides at Swethijhora had interrupted traffic in July for four days last year.The road was also damaged at 27th Mile,and at two spots at 28th Mile and 29th Mile respectively. On the other hand, the highway at 18th Mile, where the road surface has been continuously sinking for the past couple of days, is in dire condition. Authorities feared that another heavy downpour in the next 24 to 48 hours will result in total cut off of transport communications for the hills. The river Teesta has a lot to contribute to this state of affairs,as it is constantly in the process of eroding earth below the highway, resulting to sinks and cracks. There are no protection walls along the river banks. Any further disruption on the road will mean that Sikkim and Kalimpong will be cut off from the rest of the country until new construction is done. 0 Respones to "Landslips,landslides and flying boulders threaten to cut off Kalimpong,Sikkim"